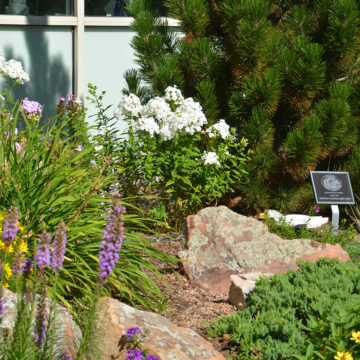 ENGLEWOOD, Colo.— Craig Hospital has received a $100,000 grant from the Colorado Garden Foundation(CGF) to create two special garden areas in a green space between the hospital’s East and West buildings. order to have an enclosed, safer campus with a cul-de-sac main entrance and accessible front garden area. The Colorado Garden Foundation grant will allow Craig to construct a Patient Arrival Garden that will provide a sense of welcome and peace to help patients and families feel calm and secure during their first moments on campus. In addition, a 9,200 sq. ft. Healing Garden will include a pedestrian promenade, plaza, water feature, seating and raised planting beds of different heights for patient therapy. The grant-funded Healing Garden will more than triple the amount of outdoor therapeutic space available for use with our patients, greatly benefitting functional patient outcomes. The Colorado Garden Foundation is a non-profit that funds Horticultural-specific projects and scholarships throughout Colorado. Grants and scholarships are awarded from ticket proceeds generated at the CGF’s two annual shows: Colorado Garden & Home Show and Colorado Fall Home Show. Since the 1970s, Colorado Garden Foundation has awarded more than $6.2 million to more than 214 organizations in Colorado. To learn about the grants and scholarship program, please visit www.ColoradoGardenFoundation.org. The Colorado Garden Foundation, a nonprofit corporation, 501(c)(3), provides funds for horticultural-related grants and scholarships for the benefit of Colorado. To date, the Foundation has awarded more than $6.2 million for horticultural projects and scholarships throughout the state. Colorado Garden Foundation presents the Colorado Fall Home Show focusing on home renovation, remodeling and sustainable living and the Colorado Garden & Home Show, the Rocky Mountain region’s largest, oldest and most prestigious consumer garden and home improvement show west of the Mississippi in February. For more information, visit ColoradoGardenFoundation.org, facebook.com/coloradogardenfoundation or Twitter @cogardenfdn.